Shown with optional cylinder lock (not included). Designed for heavy-duty applications because their rugged construction will stand up to tough use. Constructed of double-braced, heavy gauge steel for extra rigidity and support. 14-gauge double braced legs with leveling feet stabilize bench on uneven surfaces. Legs adjust from 3034" in 1" increments to accommodate sitting or standing operations. 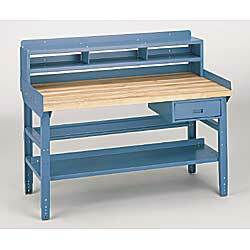 Deluxe bench includes: rugged, stacking drawer, lower shelf, riser, back and end stops, and stringers. All benches are painted blue. Benches ship knocked down to save freight. SPECIFY TOP: A - Hardwood, B - Maple, C - Shop-Mate, D - Duratop II, E - Plastic. IN STOCK. Designed for heavy-duty applications because their rugged construction will stand up to tough use. Constructed of double-braced, heavy gauge steel for extra rigidity and support. 14-gauge double braced legs with leveling feet stabilize bench on uneven surfaces. Legs adjust from 30–34" in 1" increments to accommodate sitting or standing operations. Deluxe bench includes: rugged, stacking drawer, lower shelf, riser, back and end stops, and stringers. All benches are painted blue. Benches ship knocked down to save freight. SPECIFY TOP: A - Hardwood, B - Maple, C - Shop-Mate, D - Duratop II, E - Plastic. IN STOCK. Reinforcing embossed detail. 20-ga. drawer with 18-ga. front. Removable padlock attachment and provision for cylinder lock. 17-1/4"W x 20"D x 6-5/8"H. SPECIFY COLOR: BL - Blue, TN - Tan. 16-ga. construction, 15" deep. Workbench accepts two lower shelves. SPECIFY COLOR: BL - Blue, TN - Tan. Two shelves with dividers make up 3 equal compartments. 16-ga., 10-1/2"D riser with 2" backstop that extends 12" above top. SPECIFY COLOR: BL - Blue, TN - Tan. Extend 3" above top. 16-ga. SPECIFY COLOR: BL - Blue, TN - Tan. 15-ga. stringers keep bench from spreading. SPECIFY COLOR: BL - Blue, TN - Tan. 14-gauge steel legs have additional horizontal brace. Adjust from 3034" in 1" increments. SPECIFY COLOR: BL - Blue, TN - Tan. STANDARD BENCHINCLUDES TOP, LEGS, AND STRINGER. XB-1645A 121	 60" x 30"
XB-1646A 144	 72" x 30"
XB-1647A 158	 72" x 36"
XB-1645B 121	 60" x 30"
XB-1646B 146	 72" x 30"
XB-1647B 164	 72" x 36"
XB-1645C 122	 60" x 30"
XB-1646C 175	 72" x 30"
XB-1647C 205	 72" x 36"
XB-1645D 119	 60" x 30"
XB-1646D 139	 72" x 30"
XB-1647D 155	 72" x 36"
XB-1645E 137	 60" x 30"
XB-1646E 157	 72" x 30"
XB-1647E 181	 72" x 36"
XV-1410A 213	 60" x 30"
XV-1411A 246	 72" x 30"
XV-1412A 261	 72" x 36"
XV-1410B 215	 60" x 30"
XV-1411B 248	 72" x 30"
XV-1412B 265	 72" x 36"
XV-1410C 244	 60" x 30"
XV-1411C 277	 72" x 30"
XV-1412C 308	 72" x 36"
XV-1410D 211	 60" x 30"
XV-1411D 241	 72" x 30"
XV-1412D 257	 72" x 36"
XV-1411E 259	 72" x 30"
XV-1412E 284	 72" x 36"
Lock for Stackable Drawer. Specify: A - Keyed alike, B - Keyed differently. ZA-0330A Keyed alike	 Wt. 0.2 lbs. ZA-0330B Keyed differently	 Wt. 0.2 lbs. XB-1649BL Wt. 22 lbs. Blue	 60"L.
XB-1649TN Wt. 22 lbs. Tan	 60"L.
XB-1650BL Wt. 27 lbs. Blue	 72"L.
XB-1650TN Wt. 27 lbs. Tan	 72"L.
XB-1651BL Wt. 36 lbs. Blue	 60"L.
XB-1651TN Wt. 36 lbs. Tan	 60"L.
XB-1652BL Wt. 42 lbs. Blue	 72"L.
XB-1652TN Wt. 42 lbs. Tan	 72"L.
XB-1653BL Wt. 12 lbs. Blue	 60"W x 30"D.
XB-1653TN Wt. 12 lbs. Beige	 60"W x 30"D.
XB-1654BL Wt. 13 lbs. Blue	 72"W x 30"D.
XB-1654TN Wt. 13 lbs. Beige	 72"W x 30"D.
XB-1655BL Wt. 14 lbs. Blue	 72"W x 36"D.
XB-1655TN Wt. 14 lbs. Beige	 72"W x 36"D.
XB-1656BL Wt. 8 lbs. Blue	 60"L.
XB-1656TN Wt. 8 lbs. Tan	 60"L.
XB-1657BL Wt. 10 lbs. Blue	 72"L.
XB-1657TN Wt. 10 lbs. Tan	 72"L.
XB-1658BL Wt. 21 lbs. Blue	 30"D.
XB-1658TN Wt. 21 lbs. Beige	 30"D.
XB-1659BL Wt. 24 lbs. Blue	 36"D.
XB-1659TN Wt. 24 lbs. Beige	 36"D.